Traveling through downtown McKees Rocks, you can’t help but notice subtle changes to the landscape along the Chartiers Avenue business district. There are building facade updates, additions to the outdoor space at Rocks Landing, signs of forthcoming construction at the Roxian Theatre, updated logos on the municipal trash cans, a new home for the library and additional food offerings from the coffee shop at Renewal Cafe. And then there is that sign with the teal background and white lettering that simply says, “thrive.” What exactly is that supposed to mean? 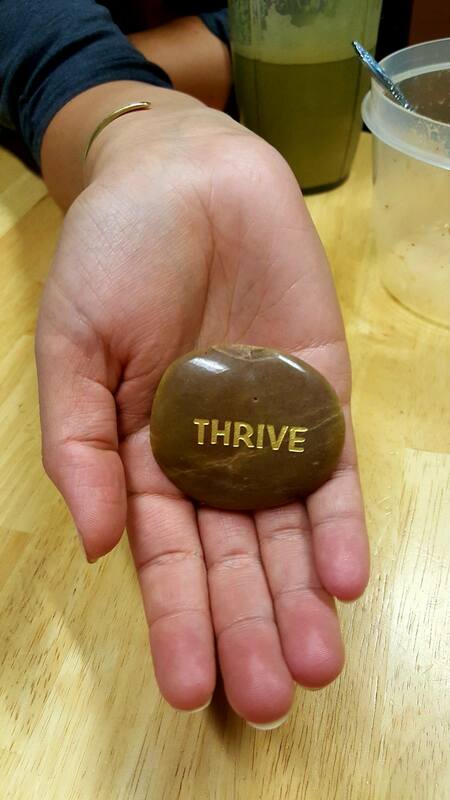 Thrive is actually the concept behind and a catchphrase for the new Sto-Rox Community Resource Center. “We seek to create a pathway out of generational poverty by meeting people where they live,” says Taris Vrcek, executive director of McKees Rocks Community Development Corporation, one of the driving forces behind the creation of this one-stop shop allowing people to reach out for help from important resources. “The Sto-Rox community provides opportunities for an enriching quality of life that many people aren’t aware of, or don’t feel connected to,” says Vrcek. Created in direct response to mental health issues prevalent within the McKees Rocks and Stowe Township populace, the resource center began offering a helping hand in June and operates under the umbrella of Focus On Renewal. Presently, center membership is at 111 and climbing. Partners had been hoping to see 100 members by December, but have already exceeded those expectations. By that she means members are actively seeking employment or educational opportunities, volunteering within the community and participating in therapeutic courses which provide a different take on life and a direction. Current courses being offered for members include healthy eating/diabetic-friendly culinary classes, Tai-chi, ceramics, and even makerspace opportunities. A grand opening celebration for partners and funders, which includes the Richard King Mellon Foundation, Staunton Farm Foundation, and others is being held this month and a community open house is being planned prior to the Thanksgiving holiday. For those curious about learning more, mental health provider committee meetings are held at 8:30 a.m. on the first Thursday of the month at the Ryan Arts and Cultural Center, 420 Chartiers Ave., McKees Rocks. A newer sub-committee on the topic of opioids meets at 8:30 a.m. on third Thursdays at the lower level of the resource center, 500 Chartiers Ave., McKees Rocks. If you know of someone who will benefit from becoming a center member, coffee and conversation hours are weekdays from 9:30 a.m. to 12:30 p.m. at the Sto-Rox Community Resource Center.